Description: Fountains shopping center affords you the chance to select that perfect auto sale part for your fountain that you have been longing. They are fitted parts in all ranges for your big fountain designs of architectural fountains, fountain landscaping to moderate outdoor fountains like ball fountains, rotating ball fountain to sports fountains like the springs golf course, or a soccer fountain. Go on out then and get busy, shopping! 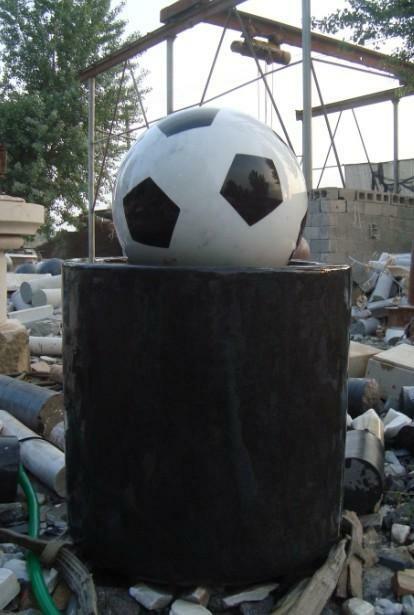 20 inch width soccer ball. White marble with black marble inserts. Sits on black marble base 30 inches high x 30 inches wide. Etch your favorite Team Logo and name on the base. Available for immediate shipment.